Show Us You Can Dance! “Show Us You Can Dance!” says the Berkeley Arts Council. Young dance students in Berkeley County and around the four-state region are invited to gain competition experience and maybe win cash prizes in the second annual “Show Us You Can Dance” competition. On Saturday, March 31, entrants will audition for the opportunity to perform in the finals on April 28. Both events will be held at Musselman High School in Inwood, WV. Registration is available online or applications may be downloaded from the Berkeley Art Council’s website, www.berkeleyartswv.org. Registration is open and the deadline is March 15. Time slots for the preliminary round of Auditions are assigned in the order that registration is received. Guidelines for the competition and information on the event are available online.Applications are accepted online and by mail. Categories that dancers may enter include Solo (ages 9 – 12), Solo (ages 13 – 18), Duets (ages 9 – 12), Duets (ages 13 – 18), Small groups (3 to 10 dancers), and Large Groups (11 – 20 dancers). Most dance styles are accepted. See web site for details. For questions, email youcandance@berkeleyartswv.org or call 304-262-1611 to receive an application package. The Berkeley Arts Council is a 501(c)(3) nonprofit organization dedicated ensuring that Berkeley County has a vibrant arts environment by promoting participation and appreciation of the literary, visual and performing arts. The deadline for submission to the Second Art and Earth Juried Art Exhibit is less than a month away. The deadline for submission is February 20, 2012. The Berkeley Arts Council has announced a preliminary prize fund of $600. Additional cash prizes may be offered depending on entries. The exhibit, which will be produced by the Berkeley Arts Council in collaboration with The Arts Centre in Martinsburg, WV, has the theme “Art and Earth: My Art – My World.” Artists in all media are invited to submit works that express their feelings about nature and the environment. Details, including entry forms and the full schedule are posted on the Berkeley Arts Council web site (www.berkeleyartswv.org). For more information contact Rip Smith at 304-596-0873 or email berkeleyartswv@gmail.com. The Arts Centre (www.theartscentre.org), a 501(c)(3) organization located in the historic Federal Building in Martinsburg, WV, continues an over 20 year commitment to providing educational experiences in the arts for children and adults in the Eastern Panhandle and Quad-state region. 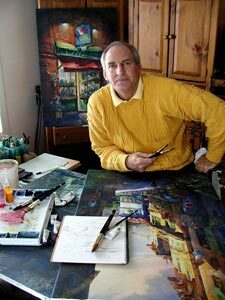 The Berkeley Arts Council is pleased to announce a Watercolor Workshop with renowned watercolorist and instructor Tom Lynch on July 10-13, 2012 at the Holiday Inn in Martinsburg, WV. This is the first time in several years that Tom Lynch has held a workshop on the East Coast. The BAC is very excited to bring this opportunity to our regional artists and to invite artists from outside our area to join us for this excellent workshop. The cost for the four-day workshop is $400 plus food and lodging. Reduced room rates are available to workshop participants at the Holiday Inn. Space is limited and participant registration is on a first come, first served basis. For more information or reserve a space in the workshop, please go to the Berkeley Arts Council website at http://www.berkeleyartswv.org/workshops.